For my birthday, which happened to coincide with the deadline to offer arbitration to your own free agents, I thought I'd buy myself a baseballreference.com player page, and simultaneously support Sean Forman's work over there. Because I'm a cheapskate, I looked for a bargain, something in the $10 range, and couldn't come up with much. Actually, I tried to get Dr. Strangeglove, but somebody beat me to him. So I found Bob Uecker, and his nearly 50,000 visits for a paltry $15. I've gotten a little traffic, but now my bet is paying off in spades. 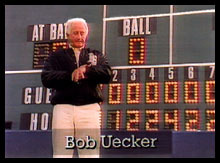 Everyone's favorite self-effacing ex-backstop, Bob Uecker , has been elected to the National Baseball Hall of Fame. Sorta. Actually, he's been given the Ford C. Frick Award for broadcasting, which is better than a poke in the eye with a sharp frick. Err...stick. Bob Uecker (Front Row, MO): Hey, how come it's taken this long for me to get into the Hall of Fame? I was a better hitter AND broadcastert than Scooter...or at least I am now. Rob Neyer: (3:04 PM ET ) I don't have any idea, Bob; you certainly should have been elected years ago. Technically, though, you're not actually in the Hall of Fame . . . but that's a topic for another day. Thanks for all the great questions, and I'll be doing this again soon. OK, so that was me, getting Bob some publicity in his name. Rob never answers my questions in chat sessions, so I figured that this was the only way. Acyually, I first tried asking a question as "Buddy Bailedout (Macho Grande):" buddy wasn't having any of it. So anyway, welcome, all you Uecker fans, to Boy of Summer. Hope you'll come back.